Kitchen Classics Summer Newsletter brings the latest news from your source for single family and multi family kitchens and baths. We are a single source for kitchen and bath needs from design to installation. We are often asked if there are alternatives to an all-white kitchen. 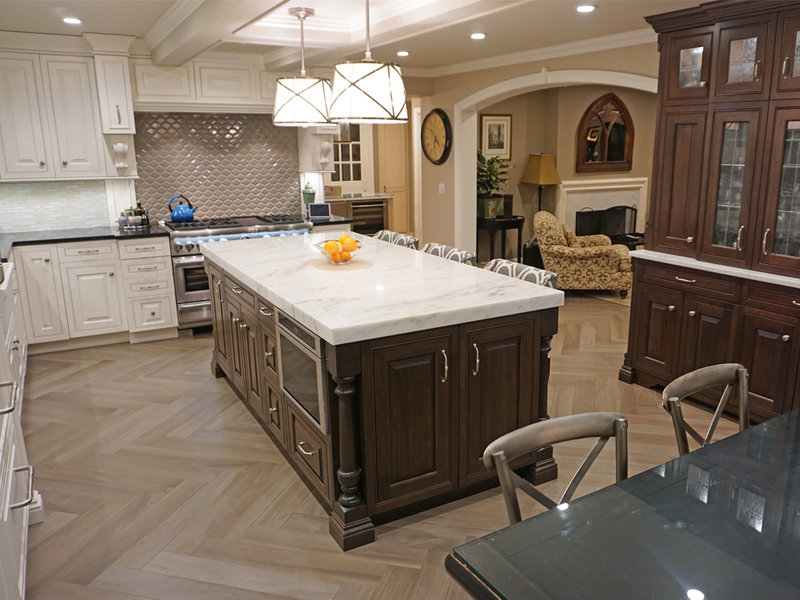 Many people prefer the richness that darker wood cabinetry can bring to a kitchen. Variations of Cherry and Walnut stains and glazes allow a range of deeper colors than white or light gray cabinets provide. The answer is yes, and the solution to satisfy the multiple preferences some clients have is a two-toned color scheme. By two-toned we mean there are two distinct colors - typically one dark and one light. 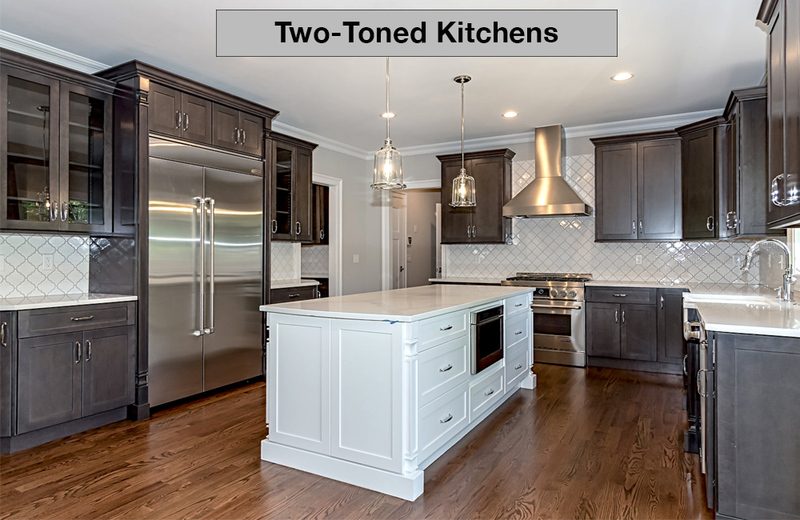 The picture above and below illustrate the choices in two kitchens we designed and installed. The floor and wall cabinets are are a dark stain, while the center island is all white. The effect is elegant but light and airy - not too dark, not too white. A white backsplash tile used on three walls and a light gray paint on select walls rounds out the color scheme and effect. Talk to our designers (Call Lead Kitchen Designer Yury Slobodsky at 908-964-7101, Extension 17 to discuss a range of color options we can help you create on your new or renovated kitchen. Another example of a two-toned kitchen we designed and installed. Two recent Kitchens we designed and installed show how great a modern Butler's Pantry can be. A Butler's Pantry is defined as a area between the dining room and kitchen used for storage and serving. 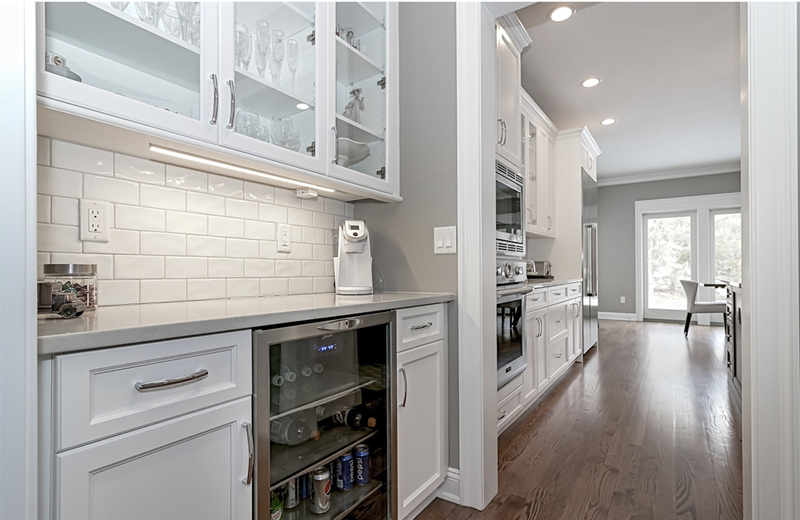 The modern twist is that it often includes electrical outlets for appliances and phone charging, and a beverage refrigerator, while adding floor and wall cabinets, all while retaining additional counter space. 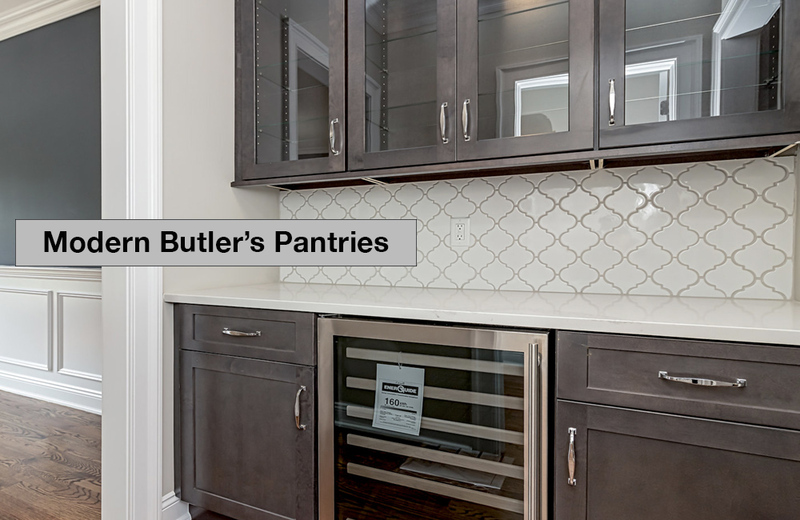 Clients have told us they love the Butler's Pantries we have designed and installed. They appreciate the extra space for a range of reasons, including the ability to quickly clean the main kitchen counters of clutter before spontaneous guest visits. The Kitchen Classics and E&F Contractors have built deep relationships with premier multi-family residential developers throughout the northeast. 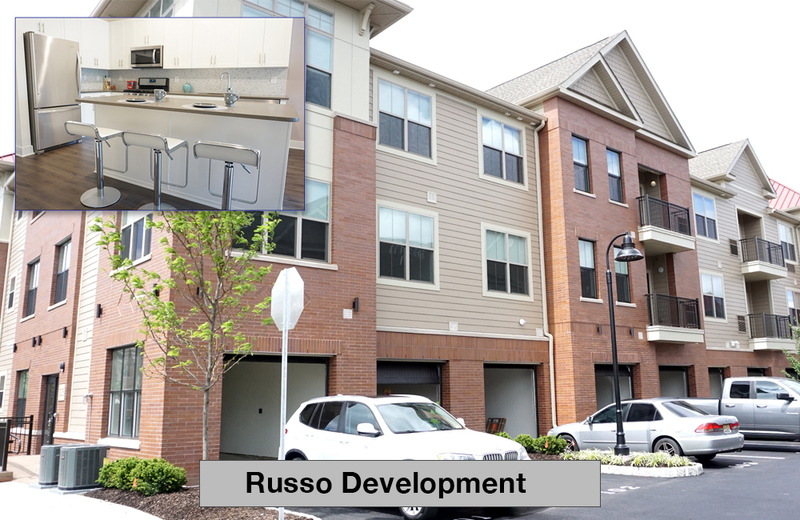 Russo Development of Carlstadt, New Jersey is an example of a privately held developer with a wide portfolio of projects including a number of beautifully built and managed multi-family properties. 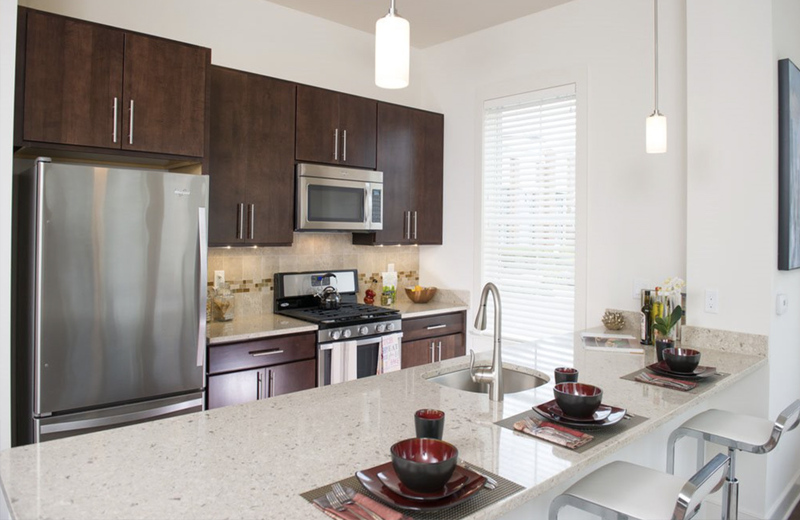 The Kitchen Classics, through our multi-family sister company E & F Contractors is designing and installing kitchens in over 300 units spread across two Karney, New Jersey multi-family residential projects. 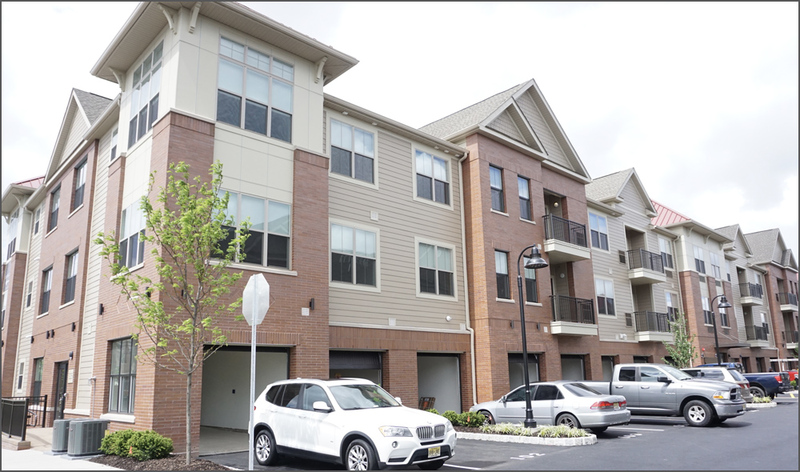 Vermella Crossing & Vermella West are beautiful multi-family projects in Kearny, New Jersey. 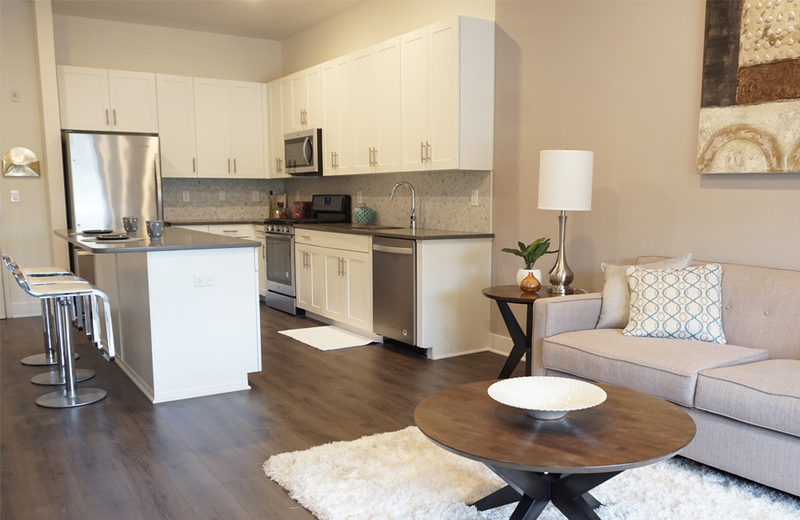 The luxury rental apartments comprise over 300, 1 or 2 -bedroom units with studios available in the newest section. 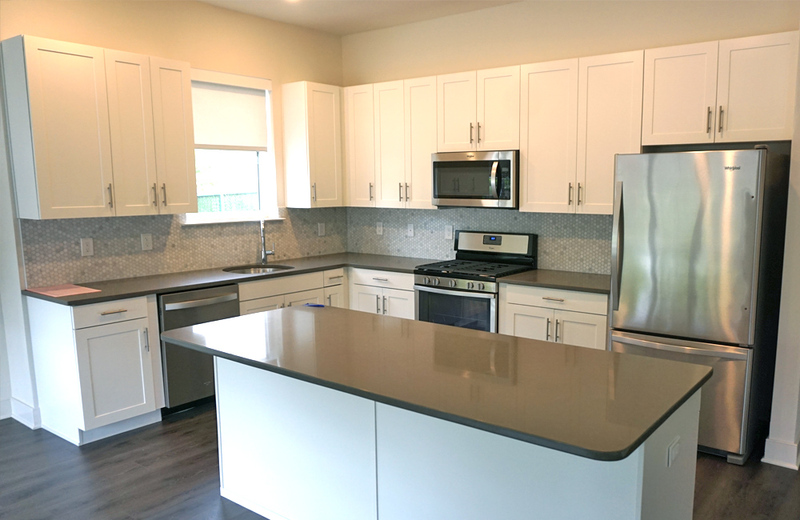 Multiple kitchen configurations were needed and Russo made a commitment to quality cabinets and appliances, a highly functional center island, plenty of storage space and electrical outlets, quartz countertops and more. These are high quality kitchens in a luxury rental setting close to Manhattan with all that Hudson County living provides. Numerous configurations were needed, and we will have installed nearly 600 total units between the 3 phases of this 2 location project. Russo Development has been a joy to work with, they are committed to quality, safety and an understanding of the importance of a well built, warm and friendly home that is well managed. To learn more about this multi-faceted New Jersey based developer please visit the Russo Development website here. 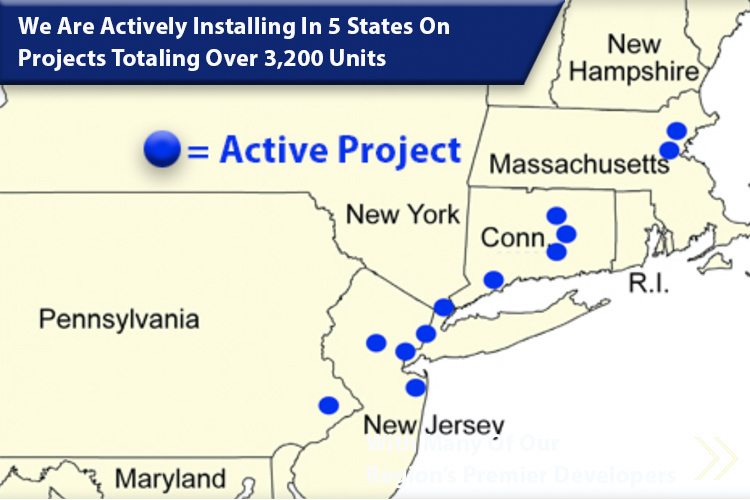 We are actively working in 5 states on multi-family projects that when completed will collectively total over 3,200 finished units.